Decades of students discovered that if they did not pay attention in class, Dr. Lang would throw chalk. "He would rant and rave in front of his students," Dr. Ribet said. "He would say, 'Our two aims are truth and clarity, and to achieve these I will shout in class.' "
I might not use the throw/rant/rave approach myself, but I'm all for truth and clarity. Equinox was today at 22:23 UTC. 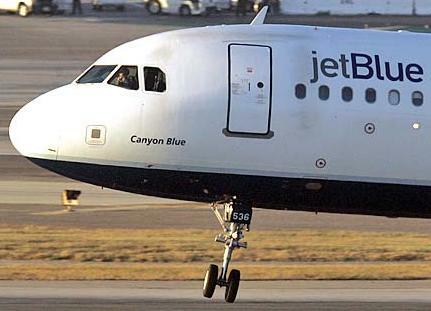 "Hey dude, something's wrong with our plane." I know I'm easily amused, but really--how often do you see that phrase in a straight news item? And. In the text of a 700+ word article in the NY Times about flight 292, one (1) word was underlined as a link to another web page. The word: Ohio. The article is about an emergency that happened in California, involving a plane operated by an airline based in New York. Los Angeles and New York are known quantities and don't need links to more info. But when Ohio was mentioned it was with a helpul link, for Times readers who might be intrigued to read about an obscure fly-over state. 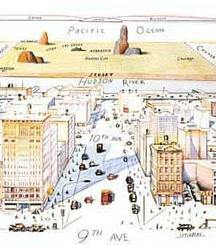 I'm reminded of A View of the World from 9th Avenue, the famous New Yorker cover (by Saul Steinberg) from March 29, 1976. According to his teachers at Julliard, 13-year-old Jay Greenberg is a musical prodigy comparable to Mozart or Mendelssohn. He says he hears symphonies in his head; he then notates them at great speed. This kind of achievement sometimes elicits comments like "if ever there was proof needed of reincarnation this kid is it." Or the ability is sometimes attributed to divine (or infernal) inspiration. Concepts like God and reincarnation are mysterious and amorphous; they don't explain much at all. But they are popular. Explaining Jay Greenberg's musical abilities as divine inspiration is about as helpful as explaining lightning by referring to Zeus. Setting prodigies aside for a moment: you and I perform amazing tasks every day without understanding how we do it. You can recognize someone's face in a fraction of a second, in varied lighting conditions, and even making allowances for effects of aging if you haven't seen the person for years. The computation required to recognize a face is done "behind the scenes"--it's not a conscious process--but it's real work, and wouldn't happen without the sophisticated nervous systems we have. But back to Jay Greenberg. He described his experience of hearing complete musical works without making reference to the supernatural: "It's as if the unconscious mind is giving orders at the speed of light." Your unconscious mind recognizes a face with amazing speed too, and presents its conclusion to your conscious mind without any clues as to how it did it. Jay Greenberg's talent is unusual; it's wild; I'd like to understand how it works (just as neuroscientists would like to understand how we can recognize faces so quickly); but I don't think it's evidence of a channel to another realm. I'll be interested to see how Jay Greenberg's career unfolds; I'll be interested to see what kind of music he writes. So far I've only found one web page with streaming audio of one of his compositions. I was watching the Roberts confirmation hearings this morning (until it was time to leave for a day of climbing* ). From what I'd heard about Roberts (including what an employee where he'd worked told me) I was hoping he'd be less evasive. Naïve me, I suppose. I was watching when Joe Biden got frustrated and described Roberts' beside-the-point answers as "filibustering". Chairman Arlen Specter told Biden to not interrupt; Biden said to Roberts "Go ahead. Go ahead and continue not to answer." I don't think I'm going out on a limb when I say that I expect Roberts won't be another Souter, but rather will turn out to be pretty much what you'd expect a nominee from this president to be. Unfortunate in my opinion, but ob-la-di, ob-la-da. At least Roberts is widely recognized as being well-qualified (unlike the second Justice appointed by Bush père). * climbing today was made possible by a partner willing to lead a route ("Delirious" at Whitney Portal) outfitted with manky ¼" bolts. After explaining this to one friend, he asked me whether my current approach to life made me happier than I used to be. I said it's not that simple; how do you compare two different times of your life, each with its own pros and cons? Do you prefer physics to biology? Did you like that play? Did you enjoy your year abroad? What makes us want to compress so much into such inexpressive summaries as "like," "prefer," and "enjoy"? ... Neither the state of the world nor that of the mind is ever so simple that it can be expressed in a single, one-dimensional judgment. ... So we ought to be suspicious when we find ourselves liking something very much, because that might mean some of our agencies are forcefully suppressing other possibilities. I'm impressed by the quality of most Wikipedia articles. I've evaluated it by reading articles on topics I'm familiar with, and generally they've been solid. It's an interesting experiment, and in a way a heart-warming one: it's refreshing to see a substantial work arise from so free a process. Anyhow, back to Wikipedia. The quality of many of its articles can be seductive in the sense that it lulls you into trusting it. That kind of talk strikes me as characteristic of the (American) culture he (and I) grew up in. Not every culture fosters such exalted expectations for romantic love. Copulation is spiritual in essence -- or it is merely friendly exercise. On second thought, strike out "merely." Copulation is not "merely"--even when it is just a happy pastime for two strangers. But copulation at its spiritual best is so much more than physical coupling that it is different in kind as well as in degree. The saddest feature of homosexuality is not that it is "wrong" or "sinful" or even that it cannot lead to progeny--but that is more difficult to reach through it this spiritual union. Not impossible--but the cards are stacked against it. But--most sorrowfully--many people never achieve spiritual sharing even with the help of male-female advantage; they are condemned to wander through life alone. I am convinced that for most natures and perhaps for all, a certain degree of ascetic practice is necessary if the individual it to attain his highest possibilities. [...] Man wins power in any direction by concentration of effort in the appropriate sense, but this involves inevitably a suppression of diffused activity. But after all is said and done, asceticism related to the carnal nature belongs only to the kindergarten stage of the training for the Higher Life of man. The higher and genuinely adult asceticisms are of an entirely different nature. Thus, when a man learns to become detached with respect to his pet opinions or ideas, and is willing to accept conclusions quite counter to his preferences when either evidence of logic points that way, then he is practicing asceticism in a higher and nobler sense. Anyhow. I strained the flexor tendons in my left ring finger while climbing today. (I had a similar injury four summers ago, but in a different finger.) It feels like it'll take about two months to get back to near-normal. Until then, I'll climb with nine fingers. I hurt the left ring finger this time. Feel free to interpret that symbolically if you like.